Do you have sagging skin? Want to regain that youthful look? 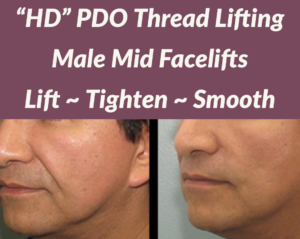 PDO (Polydioxanone) provides a non-surgical procedure that lifts and rejuvenate skin with very little down time. The procedure has been around for many years it involves the use of 2nd generation threads that are injected into the skin much like facial fillers. 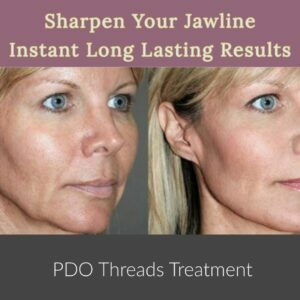 PDO is utilized like most injectable fillers, a small needle is inserted into the skin which carries the actual PDO thread. The needle is removed and the PDO thread remains under the skin. The thread then promotes the body to naturally create collagen which lifts the skin. Within a short time the thread naturally dissolves leaving new collagen in the treated area providing a non-surgical lift and rejuvenation to the skin. PDO can be used in areas of the face and the body to restore elasticity by creating new collagen that lifts and restores your skin. The cheeks and lower face, in particular, benefit greatly from the procedure. This treatment is surprisingly safe. Compared to fillers, the side effects are, in fact, much milder. 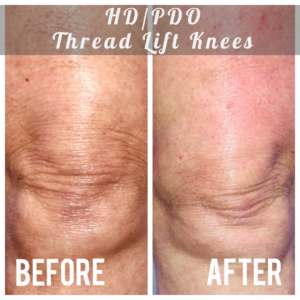 Because PDO threads are inserted via needles and not surgery, and are absorbed in 6-8 months. Depending on the types of threads used and areas treated, bruising may or may not occur. Expect some mild swelling and soreness for 3 to 5 days after the procedure, and a sensation of tightness (mild) of up to 2 weeks. Temporary mild dimpling of the skin can also occur – and resolves in a few days. 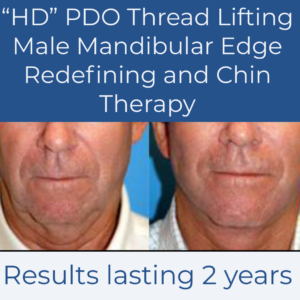 The PDO Thread Lift is an effective non-surgical facelifting treatment that is suitable for anyone looking to improve the appearance of sagging skin. 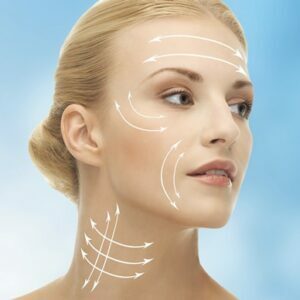 This treatment is suitable for someone who is willing to undergo some injections, and who want to attain an immediate lift of the facial contours without undergoing a facelift surgery. 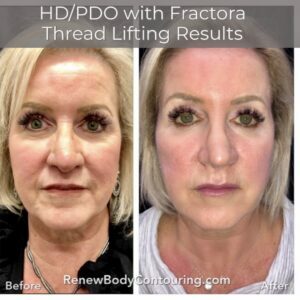 It is best suited for men and women who are unwilling to tolerate the long downtime and cost of a facelift surgery but want to look refresh and lifted – naturally. 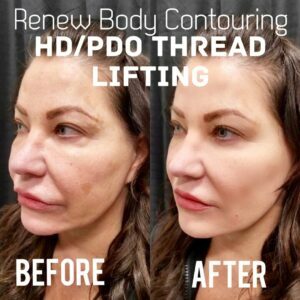 Contact Renewbody Contouring to receive a free consultation and see if PDO Threads is right for you.